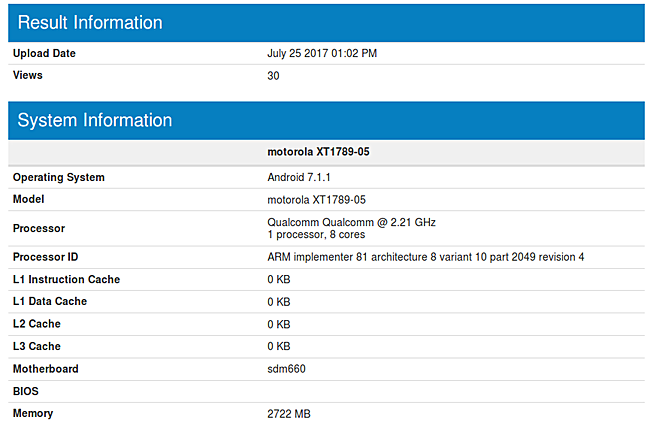 After GFXBench, the Motorola XT1789 - which is alleged to be the Moto X4 - has now been spotted on the Geekbench benchmarking website. While the listing confirms 3GB RAM and Android 7.1.1 OS, it also mentions a Snapdragon 660 SoC. Previously GFXBench pointed to a Snapdragon 630 chipset instead. Either one of the benchmarks got that wrong, or we are looking at two different versions of the handset . The Moto X4 is rumored to sport a 5.2-inch Full HD display and 12MP rear + 16MP front cameras. Yeah no phone in motos lineup is anywhere near the size of the original moto x, which for me was close to perfect in smartphone size and ergonomics. There are rumors of a 4.6" moto, but if that happens it'll probably be sd 430 or something. there is Bluetooth 5.0, it will be enable by update read the article kid. the battery is not a big deal for me sense I have a moto mood. A glimmer of hope, perhaps they wonÂ’t mess this one up as badly as the Z2 Force with its many shortcomings and ridiculous price accompanying those many shortcomings.